Mars: Do Remnants of Ancient Hot Springs Point to Microbial Life? Scientists have discovered for the first time direct physical evidence of the existence of opals on Mars. The traces of the precious stone, which were found in a Martian meteorite, could help future exploration missions decide where to look for evidence of life on the red planet. “We know that on Earth opals like these are often formed in and around hot springs," said Martin Lee, of the University of Glascow, School of Geographical and Earth Sciences. "Microbial life thrives in these conditions, and opal can trap and preserve these microbes for millions of years. If Martian microbes existed, it’s possible they too may be preserved in opal deposits on the surface of Mars. 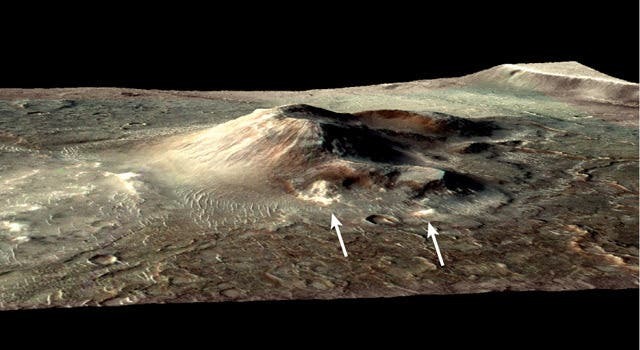 The image above shows volcanic cone in the Nili Patera caldera on Mars, which has hydrothermal mineral deposits on the southern flanks and nearby terrains. Two of the largest deposits are marked by arrows, and the entire field of light-toned material on the left of the cone is hydrothermal deposits. University of Glasgow researchers discovered the opal in a 1.7-gram fraction of the Martian meteorite known as Nakhla, which was supplied by the Natural History Museum in London. Nakhla is named after the town in Egypt where it fell to Earth in 1911, millions of years after being blasted from the face of Mars by a massive impact of unknown origin. In a new paper published in the journal Meteoritics and Planetary Science, the team describes how they identified traces of the gem known on Earth as ‘fire opal’ for its brilliant orange, yellow and red colouration. Using a powerful scanning electron microscope in the University’s School of Physics and Astronomy, the team found very small traces of the gem in the rock created by the interaction of Martian water with silica within the meteorite. Martin Lee, lead author of the research paper, said: “The slice of Nakhla that we have is small, and the amount of fire opal we’ve found in it is even smaller, but our discovery of opal is significant for a couple of reasons. “It definitively confirms findings from NASA’s imaging and exploration of the Martian surface which appeared to show deposits of opal. This is the first time that a piece of Mars here on Earth has been shown to contain opal. The research builds on the team’s 2013 discovery of the first direct evidence of water dissolving the surface of Mars. They found physical traces of secondary minerals created by water interacting with the minerals olivine and augite contained within Nakhla. The team’s new paper, titled ‘Opal-A in the Nakhla meteorite: A tracer of ephemeral liquid water in the Amazonian crust of Mars’ is published in Meteoritics and Planetary Science. Mars' Impact Glass–"A Delicate Window into the Possibility of Past Life"
Saturn's Titan –"New Discovery on the Most Earthlike Object in Our Solar System"